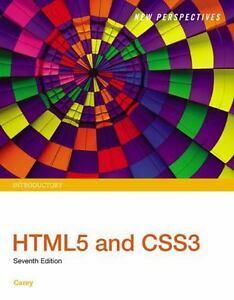 New Perspectives on HTML and CSS: Introductory by Carey, Patrick M.
recycle-a-textbook859 has no other items for sale. Details about New Perspectives HTML5 and CSS3: Introductory by Carey, Patrick M.
New Perspectives HTML5 and CSS3: Introductory by Carey, Patrick M.
New Perspectives on HTML and CSS 7th Edition delivers a hands-on approach to learning Web page design. In each tutorial, you'll put into practice the concepts you have learned. Each tutorial includes a basic statement of the problem, the goals to be achieved, and a demonstration of how to complete the task, creating a fully functional website in the process. You will develop problem-solving skills which will help retain the material and apply what you've learned in a professional environment. Successful completion of the tutorial cases and case problems can act a springboard to develop your own portfolio to showcase your abilities in website design. Sales tax may apply when shipping to: AL(9.01%), CO*(7.5%), CT*(6.35%), GA*(7.0%), HI*(4.35%), IL*(8.64%), IN*(7.0%), IA*, KY*(6.0%), LA(9.98%), ME(5.5%), MA(6.25%), MN*, MS(7.07%), NJ*(6.85%), ND*(6.78%), OH*(7.14%), OK(8.86%), PA*(6.34%), RI*(7.0%), SC*(7.22%), SD*(6.39%), TN*(9.46%), VT*(6.18%), WA*, WV*(6.29%), WY(5.4%).